How should we go about assessing past projections? There have been updates to historical data (what we think really happened to concentrations, emissions etc. ), none of the future scenarios (A, B, and C) were (of course) an exact match to what happened, and we now understand (and simulate) more of the complex drivers of change which were not included originally. The observed changes 1984-2017 are 0.19±0.03ºC/decade (GISTEMP), or 0.21±0.03ºC/decade (Cowtan and Way), lying between Scenario B and C, and notably smaller than Scenario A. Compared to 10 years ago, the uncertainties on the trends have halved, and so the different scenarios are more clearly distinguished. By this measure it is clear that the scenarios bracketed the reality (as they were designed to), but did not match it exactly. Can we say more by looking at the details of what was in the scenarios more specifically? Yes, we can. Estimates of CO2 growth in Scenarios A and B were quite good, but estimates of N2O and CH4 overshot what happened (estimates of global CH4 have been revised down since the 1980s). CFCs were similarly overestimated (except in scenario C which was surprisingly prescient!). Note that when scenarios were designed and started (in 1983), the Montreal Protocol had yet to be signed, and so anticipated growth in CFCs in Scenarios A and B was pessimistic. The additional CFC changes in Scenario A compared to Scenario B were intended to produce a maximum estimate of what other forcings (ozone pollution, other CFCs etc.) might have done. But the model sees the net effect of all the trace gases (and whatever other effects are included, which in this case is mainly volcanoes). So what was the net forcing since 1984 in each scenario? There are multiple ways of defining the forcings, and the exact value in any specific model is a function of the radiative transfer code and background climatology. Additionally, knowing exactly what the forcings in the real world have been is hard to do precisely. Nonetheless, these subtleties are small compared to the signal, and it’s clear that the forcings in Scenario A and B will have overshot the real world. If we compare the H88 forcings since 1984 to an estimate of the total anthropogenic forcings calculated for the CMIP5 experiments (1984 through to 2012), the main conclusion is very clear – forcing in scenario A is almost a factor of two larger (and growing) than our best estimate of what happened, and scenario B overshoots by about 20-30%. By contrast, scenario C undershoots by about 40% (which gets worse over time). The slight differences because of the forcing definition, whether you take forcing efficacy into account and independent estimates of the effects of aerosols etc. are small effects. We can also ignore the natural forcings here (mostly volcanic), which is also a small effect over the longer term (Scenarios B and C had an “El Chichon”-like volcano go off in 1995). The amount that scenario B overshoots the CMIP5 forcing is almost equal to the over-estimate of the CFC trends. Without that, it would have been spot on (the over-estimates of CH4 and N2O are balanced by missing anthropogenic forcings). What do these projections tell us about the real world? Can we make an estimate of what the model would have done with the correct forcing? Yes. The trends don’t completely scale with the forcing but a reduction of 20-30% in the trends of Scenario B to match the estimated forcings from the real world would give a trend of 0.20-0.22ºC/decade – remarkably close to the observations. One might even ask how would the sensitivity of the model need to be changed to get the observed trend? The equilibrium climate sensitivity of the Hansen model was 4.2ºC for doubled CO2, and so you could infer that a model with a sensitivity of say, 3.6ºC, would likely have had a better match (assuming that the transient climate response scales with the equilibrium value which isn’t quite valid). In June 1988, at the Senate hearing linked above, Hansen stated clearly that he was 99% sure that we were already seeing the effects of anthropogenic global warming. This is a statement about the detection of climate change – had the predicted effect ‘come out of the noise’ of internal variability and other factors? And with what confidence? In retrospect, we can examine this issue more carefully. By estimating the response we would see in the global means from just natural forcings, and including a measure of internal variability, we should be able to see when the global warming signal emerged. The shading in the figure (showing results from the CMIP5 GISS ModelE2), is a 95% confidence interval around the “all natural forcings” simulations. From this it’s easy to see that temperatures in 1988 (and indeed, since about 1978) fall easily outside the uncertainty bands. 99% confidence is associated with data more than ~2.6 standard deviations outside of the expected range, and even if you think that the internal variability is underestimated in this figure (double it to be conservative), the temperatures in any year past 1985 are more than 3 s.d. above the “natural” expectation. That is surely enough clarity to retrospectively support Hansen’s claim. At the time however, the claim was more controversial; modeling was in it’s early stages, and estimates of internal variability and the relevant forcings were poorer, and so Hansen was going out on a little bit of a limb based on his understanding and insight into the problem. But he was right. Undoubtedly there will be claims this week that Scenario A was the most accurate projection of the forcings [Narrator: It was not]. Or they will show only the CO2 projection (and ignore the other factors). Similarly, someone will claim that the projections have been “falsified” because the temperature trends in Scenario B are statistically distinguishable from those in the real world. But this sleight of hand is trying to conflate a very specific set of hypotheses (the forcings combined with the model used) which no-one expects (or expected) to perfectly match reality, with the much more robust and valid prediction that the trajectory of greenhouse gases would lead to substantive warming by now – as indeed it has. Selective quotation. Probably not so coincidental that all of the cites are from 2014 or earlier. The fact is that in model runs, one can find many examples of such ‘pauses’. That is also true for synthetic data specifically constructed to have the same trend and variability as real temperature time series. Victor, Karl 2015 came after 1998 to 2014. This may be difficult, but try to imagine what scientists would have called the period 1998 to 2014 if Karl15 had instead been published in 1997. Much study has been devoted to the possible causes of an apparent decrease in the upward trend of global surface temperatures since 1998, a phenomenon that has been dubbed the global warming “hiatus.” Here we present an updated global surface temperature analysis that reveals that global trends are higher than reported by the IPCC, especially in recent decades, and that the central estimate for the rate of warming during the first 15 years of the 21st century is at least as great as the last half of the 20th century. These results do not support the notion of a “slowdown” in the increase of global surface temperature. AB: O God NO NO NO NO NO NO! You need to stop. To ignore all data after 2013 is cheating, especially since the top four years have been post 2013, and by a WIDE margin. “Victor Grauer of Pittsburg PA.” Pittsburg is coal country. I wonder if Victor has interests in the coal business? As a fellow Pittsburgher to Victor, please allow me to point out that the name of the city is “Pittsburgh,” with an “H” on the end. It’s the only “Pittsburg” in the country with that distinction. As an outsider who has only dropped in thanks to a link from Brad DeLong, on ploughing my way through the comments I am astonished at the extent to which the community here allows itself to be sidetracked by trolling from Victor and his ilk. The article itself is important, substantial and interesting and the first few comments are a reasoned discussion among like-minded individuals that adds significant extra value. Once Victor surfaces, however, the discussion rapidly degenerates With almost all the time and energy now being spent rebutting one single person whose raison d’etre is holding a contrarian position regardless. Surely a better use of everyone’s effort is to ignore Victor in this channel and instead carry out arguments like the one above in the comments section of the WSJ or similar wider public forums where there is at least a chance that otherwise disengaged bystanders will be swayed. I agree with Tamino. Stating Victor’s city is uncomfortably close to doxing. I would encourage moderators to not post comments (not even in the Borehole) including his location. OTOH, I’m thinking from my lay perspective and following the issue over 30 years, the observed negative effects and knock on ramifications of climate change on very complex earth & human systems (including conflict and wars from these) have been a lot worse and more plenty than expected way back in the late 80s. At least I was underestimating the harms to humans and other creatures, and I’m an alarmist. Perhaps Arrhenius was even thinking a century ago, global warming, a couple degrees warming here in Sweden would be nice. CCHolley at comment 126 demonstrates that he does not understand thermodynamics. There is no law of physics that says that energy in is equal to energy out. The correct law of physics is conservation of energy. Hence energy can be stored or released and as a result will cause the temperature to rise and fall. The comment also displays the emphasis on the surface of the earth and that is a huge mistake and is based on nothing more than it is the place where we live. There is no reason why any place in the earth’s system should have a temperature that is controlled to be within certain limits desirable to us. Goodness knows what is meant by “natural variations cannot control the energy in or out”. The energy coming into the earth’s climate system and the amount received by different places on the surface varies constantly for the obvious reasons. So the question is where does the energy come from to drive the temperature increase? It certainly cannot come from carbon dioxide or any other gas. Gases do not spontaneously generate thermal energy. Hanson and his followers have never been able to explain where the extra energy comes from and this is because the entire science of human caused global warming is a complete fraud. The comment by Fred Magyar at 147 demonstrates the problem of identifying what global warming even means. The earth’s climate is a very complex, nonlinear system and one thing is certain and it is that an average temperature is absolutely meaningless to describe the changes to the climate system. Even worse, we assume that the average temperature has to be the earth’s surface. Warming could mean an increase in temperature somewhere or it could mean an increase of the thermal energy of the total system. Surely the appropriate parameter is the total energy. We could calculate it from models but I doubt we could derive it from the known masses, specific heat and temperatures that we would need to confirm the models. Temperatures vary so much that an average surface temperature trend cannot be used to claim the total thermal energy has the same trend. Climate science is built on foundations of sand. Tamino, a notorious “climate change” blogger, is alleged to also be a statistician. He certainly seems to know something about time series. (Thanks to this investigation, we know that Tamino is Grant Foster, writer of “blog diatribe”-style climate papers. His affiliation in the linked paper is “Tempo Analytics, Westbrook, Maine”, but I can’t find any other reference to it online). It’s science’s dirtiest secret: The “scientific method” of testing hypotheses by statistical analysis stands on a flimsy foundation. Statistical tests are supposed to guide scientists in judging whether an experimental result reflects some real effect or is merely a random fluke, but the standard methods mix mutually inconsistent philosophies and offer no meaningful basis for making such decisions. Even when performed correctly, statistical tests are widely misunderstood and frequently misinterpreted. As a result, countless conclusions in the scientific literature are erroneous, and tests of medical dangers or treatments are often contradictory and confusing. From sciencenews.org. There is no law of physics that says that energy in is equal to energy out. The correct law of physics is conservation of energy. Hence energy can be stored or released and as a result will cause the temperature to rise and fall. This misconstrues the statement. What was stated is that the equilibrium temperature is based on the energy into the system versus energy out. If the energy in is equal to the energy out, then thermal equilibrium exists. The first law of thermodynamics deals with conservation of energy. The second law deals with entropy. Entropy can never decrease over time, hence heat flows from hot to cold and systems tend to move to equilibrium. When discussing temperatures and heat movement within a system we must consider both the first law and the second law. Energy is conserved and heat flows from hot to cold. Since entropy cannot decrease and heat can only flow from hot to cold, the heat can only move until it’s source is at the same temperature as the part of the system where it is moving. Movement of heat and the resulting changes in temperatures must conform to these laws. The comment also displays the emphasis on the surface of the earth and that is a huge mistake and is based on nothing more than it is the place where we live. There is no reason why any place in the earth’s system should have a temperature that is controlled to be within certain limits desirable to us. This is silly. The post was in response to Victor’s claims about the alleged pause in SURFACE temperatures. Surface temperatures was the discussion and it wasn’t emphasized anymore than just being the topic at hand. Certainly the earth doesn’t care about surface temperatures and you may think people shouldn’t care either, but you would be wrong. Yes, the energy into the earth’s climate system comes from the sun and the amount that can warm the system varies regionally and otherwise for the obvious reasons often discussed here. Natural variations in surface temperatures, those that are unforced, are not the result of changes in solar energy entering the system nor the energy leaving the system. This is not difficult to understand. No one ever claimed that greenhouse gasses spontaneously generate thermal energy. Greenhouse gases simply absorb radiated heat energy and slow the heat loss to space forcing the temperatures to rise satisfying the laws of physics. I suggest you learn what the science really says before you call it a fraud. AT 160: where does the energy come from to drive the temperature increase? It certainly cannot come from carbon dioxide or any other gas. Gases do not spontaneously generate thermal energy. Hanson and his followers have never been able to explain where the extra energy comes from and this is because the entire science of human caused global warming is a complete fraud. BPL: They don’t have to generate energy, they only have to redirect it. It is clear that you have no idea how the greenhouse effect (and thus global warming when greenhouse gases increase) is supposed to work, so your critique of it is uninformed, and thus useless. BPL: Which is hotter, Venus or Mars? Alan Thorpe’s spurious and facile assertion of fraud should deservedly relegate his comment to the Bore Hole, but to answer his question @160, it’s really very simple: the extra energy of course comes from the sun. What CO2 and other greenhouse gasses do is to block a portion of that energy from being radiated back out to space, thereby causing extra energy to accumulate in earth’s coupled ocean-atmosphere system, causing the planet to warm. Far from fraud, it is simply energy conservation in action on a planetary scale. As for his assertion that no law of physics says that energy in is equal to energy out, he is flat out wrong when a system is in thermodynamic equilibrium, in which case energy out must indeed equal energy in. If it does not then thermodynamics dictates that the system will either warm or cool until it does. It is clearly Alan Thorpe’s understanding of thermodynamics, radiative physics and planetary climate that are built on sand. Commenter Just Visiting @157 is spot on. Victor [-not-Venema] has repeatedly proven himself to be a gormless fool when it comes to climate science and statistics, and either incapable or unwilling to learn from those who repeatedly take the time to correct his multitude of errors and misinformation. We all know, or should know, that it is simply pointless to try to reason with a fool. So please just stop doing it. And I see just now that he has taken to outing Tamino and denigrating his grasp of statistics. Yes, Tamino. Isn’t it way past time that all of Victor [-not-Venema]’s comments be automatically relegated to the Bore Hole upon arrival? Victor cannot refute Tamino’s work so he has to dig and find an obscure blog post from 2010 in an attempt to smear Tamino. Strong work by Victor. The second blog post was referring to problems with hypothesis testing in science. Again, this is not what Tamino was doing so the point is moot. OK, so let me get this straight. Weaktor had to go back 8 years to find any sort of criticism of Tamino, and said criticism had nothing to do with the analysis Tamino did of Weaktor’s imbecilic contribution but rather a problematic application of Bayesian analysis where the universal conclusion was that the problem was likely ill posed from the beginning? And what is more, it is clear that Weaktor doesn’t understand even the simplest words in his links? Really? Is that really the best you have to offer? How do you not curl up and die every day from the sheer shame of being you? For Victor’s benefit, what do statisticians think of Climate Science? Let’s look at what the American Statistical Association position says about it. Both the *pause* and correlation of CO2 to temperatures are discussed. In my opinion, the purpose of Anthony Watts’ “WUWT” blog is to maximize confusion; doubt is their product. How many times has Watts himself defended posting something so stupid even his followers can’t swallow it, under the pretence that he wants all ideas to have a voice? What he really wants is to increase doubt and confusion with a “throw anything at the wall and see what sticks” approach, opening the firehose so there’s too much nonsense for anyone to resist. And it works — it’s surprising how many people will take the idea that “2 + 2 = 5” seriously! Tony Heller will tell us that 4 is just a fraud anyway, while Bob Carter will posit that actually, 2 + 2 = agenda 21. Actually I did refute it. But my refutation, like so many of my most telling posts, was relegated to the Bore Hole. The Bore Hole should be for irrelevant or offensive comments, the sort that routinely get posted here regardless, not posts that challenge long-cherished assumptions. I contacted Hal Wanless and asked him if the Jeff Goodall quote about Dr Wanless’ personal belief of “15 feet by 2100” was accurate. Dr Wanless wrote, “I was not misquoted”. Does anyone know why the 1988 Senate testimony of James Hansen is nowhere to be found in video? [MR:]Victor, did you even read that Tamino article, or subsequent ones? V: Yes, of course I read it. And I wrote a response, but it was consigned to the bore hole. Well, your response indicated that you didn’t. MR: There is no evidence of a pause or even a slow down. V: Tell that to the long list of climate scientists who have acknowledged the existence of a hiatus and gone to great lengths to explain it. Tell that to the climate scientists and mathematicians who have shown that that there was no statistically significant slowdown. I use the word “slowdown” rather than “hiatus” since I guess you are using the latter to try to pretend that there was a pause and you certainly won’t find a “long list” of climate scientists who acknowledge there was ever a pause. The science simply doesn’t support your view of climate change (though some of your replies indicate that you do acknowledge that human caused emissions have a part to play and that the earth’s surface is warming as a result of forcings including human induces ones, and you acknowledge that Hansen got many things right). Of course, cherry picked oddities may sometimes support your position, but the near totality of the research and measurements show otherwise. Plus, you really can make the case that for some of the more extreme Baysian versus frequentist advocates a “religious war” really does describe the situation correctly! 1. For VnV’s edification, tamino has been migrating to Bayesian approaches a bit more this decade. VnV apparently does not know this. 2. Your boreholed “refutation” is about as “refutational” as “nyah, nyah, nyah”. tamino has shown that finding a signal within the remaining noise is highly unlikely. That the “natural variation” you love so much in other contexts is a sufficient explanation given present methods. That some physicists have gone on and tried to find a signal within that noise does not negate his analysis. NO one has shown that there is a reliable signal in the longer term error term from the 1998 to 2015 subperiod to extract regardless of the amount of study they have brought to the problem. That physicists look for additional terms which might reduce error is part of being a physicist. Commendable, even. That no one has found such is a simple fact. I have always known that your number one goal has been to persuade people that climate change is the biggest issue facing the planet. Not everyone feels this way, and have other issues that they feel are more pressing. My main issue that we have argued about over the years, is how best to present this issue to the public. I have argued for accuracy in reporting and to portray the detriments and benefits of a warming planet, and for predictions to follow reality. That should be our purpose. For such “denialist views” you banned me from your website. Sorry, but I cannot subscribe to emphasizing the worst-case scenario, just to persuade voters. This has backfired in the past (when predictions fail to materialize), and will continue to fail in the future. I take issue with both those who claim that Hansen was wrong, and that we was spot on. He was neither. Global temperatures continued to rise, but at a much lower rate than he predicted (40% less than scenario B). Using questionable tactics to prove him right or wrong is not science, but politics or propaganda. Yes, we should educate about the science. However, not just the science that supports your views, but that which does not. Science is the [continuous] testing of hypothesize; accepting, rejecting, and modifying them as appropriate. We often learn more about our failures than our successes. Don’t just speak up for one view or the other. Rather, speak up for truth and accuracy. Sometimes, that is the hardest part – supporting the truth, when it opposes your own beliefs. Looking at the borehole nowhere does Victor show why Tamino’s lowess smoothing of the NASA average annual global temperatures that results in a consistently rising forty year trend to be done incorrectly. Nor does he show that the trend he produces using least squares regression of the period from 1975-1999 to be incorrectly done. But Victor doesn’t believe in statistics so he just does some arm waving, calls it a trick, and that constitutes a rebuttal. Dah, what happens if you eliminate BOTH the el Nino events AND the la Nina events?, Of course, this would be the fair and proper way to look at it. Do you still see a pause? NOPE. Victor-not-Venema believes he can refudiate facts by asserting his contrary beliefs. I wish someone would review his academic publication about music to see if he’s always used the same analytical approach. And yes, this is a peer-reviewed paper. …I urge you all to do the same. Continue to enjoy learning new science, keep doing battle with deniers in comment threads if that’s what you want, but do more. Help the kids at your local high school get organized. Donate to ThisIsZeroHour. March yourself. Write letters to the editor. Don’t just “speak up” on twitter and blogs, speak up in person, and don’t let nonsense in casual conversation go unchallenged. Talk to your kids about the importance of voting and of activism. Talk to youth in general, not just about the heavy price they’ll pay for the folly of older generations, but about the power they possess to make a change, if they will only use it. There is a point of view that if we are truly serious about creating social change then at least some of us should be willing to go to jail for our beliefs. Dr Hansen is one climate scientist that has already done that. Roger Hallam is co-founder of the Radical Think Tank. His PhD studies looked at protest movements and revolutionary campaigns and what factors make them successful. After several practical campaigns, including wins for precarious workers, a student rent strike, and a divestment campaign at Kings College London, he is turning his hand to climate change. In this lecture, delivered at KCL in April, he first outlines the bleak current scientific thinking on man-made climate change, then presents the results of his campaigning research, and finally invites people to join a massive civil disobedience movement to force real change and quite possibly save mankind. Can you please provide a link proving your assertions? I dont see how you arrive at 40%. From material I have seen published temperatures look reasonably close to scenario b, unless you mean the satellite troposphere record, where they may still be under by 40%. But we dont live up in the middle of the tropsphere. Even if temperatures are still under, sea level rise is ahead of modelling and the acceleration in antarctic ice loss is significant. So when I look at the “big picture” there’s nothing reassuring there. But you and Victor seem incapable of seeing the big picture. Personally I’m not one for banning all sceptical opinion, freedom of speech and all that, but I think it needs to be more ruthlessly “culled out”, with far more in the bore hole. Do I really need to link to the article we are discussing. Reread Gavin’s analysis. 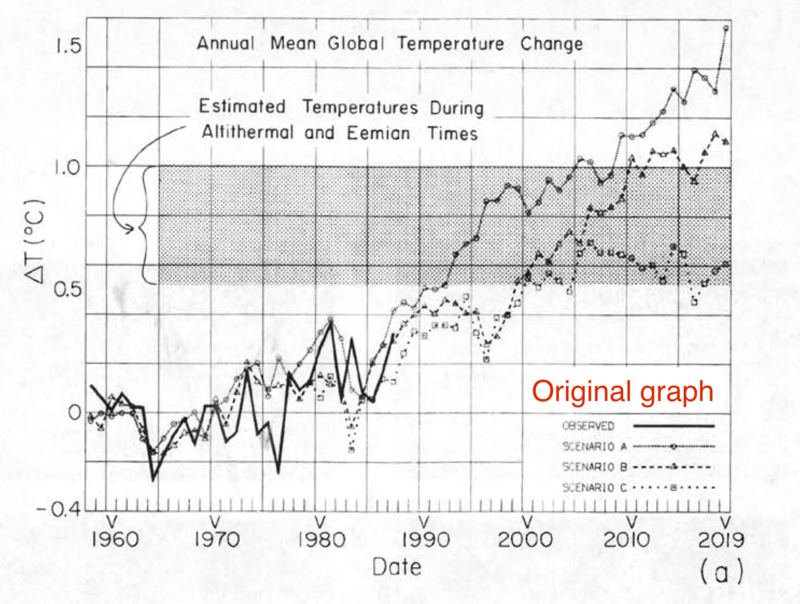 He states that the GISTEMP observed temperature rise over the past three decades has been 0.19C/decade, while the modeled rise for scenario B is 0.28C/decade. I suspect that even Hansen would not agree that current emissions are not what he envisioned in a scenario B. In his original paper, he described scenario B as a reduced incremental growth rate in CO2 until 2010, when annual increases where held constant at 1.9 ppm/year. The current growth rate is still increasing. Do we really need to do us the courtesy of actually reading the entire article? CO2 is not the only greenhouse gas. And where is your evidence that the growth rate for CO2 is still increasing? >Victor-not-Venema points to his work elsewhere. As I read it, he eyeballs the data looking for correlations and asserts them. Sigh. I haven’t found this paper cited by subsequent work, but would welcome pointers that might help understand the statistical methods claimed but not described. … Some of the earliest statistical analyses based on the Cantometric dataset tended to support the relationship quite strongly (Lomax 1962; Grauer 1965; Lomax et al 1968). All the available literature and recordings pertaining to this question were thoroughly reviewed in an independent study conducted by ethnologist/ ethnomusicologist Charlotte Frisbie. Noting that her results ‘are practically identical with those achieved by the Cantometrics system for the same area’ (Frisbie 1971:285), Frisbie concludes as follows: The comparative analysis of Bushmen and Pygmy music shows overwhelming similarities …. Because so many of the ratings tend to be general and to some degree subjective, Cantometrics is most reliable as a heuristic tool for searching and sorting along very general lines…. among all such groups using interlock. Clearly, the use of both interlock and yodel is characteristic of most Pygmy and Bushmen vocalising, yet rare in either Africa or anywhere else. The above analysis illustrates the power of Cantometrics in comparing stylistic features from the musical traditions of many different populations. 2 Partly because most musicologists were unfamiliar with such a broad-based, statistically oriented approach, partly due to sampling issues, but also because of certain questionable claims made by Lomax regarding some of his results, Cantometrics was never able to gain a secure footing among ethnomusicologists during his lifetime. Interestingly, many of the criticisms currently being levelled at the methodologies of the genetic anthropologists resemble those once directed at Cantometrics. I have provided a detailed response to several of the most typical criticisms in Grauer & McCormick 2005 …. Yeah, but all non-CO2 GHGs are way below Scenario B. Can we make an estimate of what the model would have done with the correct forcing? Yes. The trends don’t completely scale with the forcing but a reduction of 20-30% in the trends of Scenario B to match the estimated forcings from the real world would give a trend of 0.20-0.22ºC/decade – remarkably close to the observations. So that’s ~5-15%, not 40%. Read further. Gavin said that using the actual forcings Hansen’s prediction becomes .20 to .22, as compared to the actual GISS trend of .19. 19/21 = 90.5%, so Hansen was off by less than 10% using GISS. And 21/21 = 100% so using Cowtan and Way Hansen hits ‘double bull’ on the metaphorical dartboard. Russell Balest: Does anyone know why the 1988 Senate testimony of James Hansen is nowhere to be found in video? On balance, it looks like Hansens scenario b is at least reasonably close to observations. That’s good enough for me to be both impressed and concerned. Dan H: I suspect that even Hansen would not agree that current emissions are not what he envisioned in a scenario B.
AB: You’re confused. The scenarios are not even remotely related to any sort of prediction. They are simply a spread of possibilities that he figured would likely encompass humanity’s choices and random happenings (like volcanoes) “even Hansen” is an insulting error in and of itself and, as Gavin pointed out, scenario B was NOT what happened forcingwise. Forcings happened to be between B and C. Therefore, Hansen succeeded in his attempt to provide scenarios that encompassed future forcing. But, of course, if forcings had been above A or below C it would have made no difference to the accuracy of his paper. Had it been so then Gavin’s calculations would just adjust so as to encompass reality. No biggie. In fact, no smallie either. The question is whether Hansen’s model is skillful given actual forcing, not whether Hansen was skillful in predicting human behavior. And what’s with the double negative? As written your statement is pure goop. I suspect a typo. True? 184/183 I have no idea what you’re both arguing about here. Or why. I think you’re both off target imo. I think Gavin could have done a much better job “explaining” all the nuances in Hansen’s paper compared to 30 years of hard data. Doing so leaves the door open for others to see things that aren’t there and ignore those things that are there but didn’t get mentioned. Oh well, par for the course with explaining climate science to the general public and politicians and the media hacks, including what it really means and the consequences thereof. I intentionally stayed away from this thread for that very reason. I’m kind of over it. Say what? The double negative is perplexing. Yes, that was a typo. Should read even Hanson would agree. I did not feel that I needed to link to that which is generally known or easily searched. Would I need to supply a link every time I claimed that temperatures are rising? Now for one thing, my paper was reviewed by a group of anthropologists and, as you may not be aware, training in statistics is part of just about every anthropology curriculum. They never questioned my statistics because my treatment of the data was perfectly clear and straightforward. When we see the result of a political poll, and some candidate is listed as approved by 65% of those polled, no one cares whether this number has been confirmed by some mathematical formula to be “significant.” Same with the statistics I presented in that paper, which are perfectly straightforward and self-explanatory. Offering some sort of “statistical” analysis based on “linear regression” or any other formal procedure would be ludicrous in the extreme. And if you can’t see that then I’m sorry but you know zilch about statistics – or much else for that matter. What does James Hansen himself have to say about the 30th Anniversary? Where is his focus today? What does he think the important issue are 30 years later? What meaning does he take away from the last 30 years of climate science and the failure of deploying practical solutions to climate change? Within four years, almost all nations, including the United States, signed a Framework Convention in Rio de Janeiro, agreeing that the world must avoid dangerous human-made interference with climate. Young people are puzzled that, 25 years ago, President Clinton terminated R&D on next-generation safe nuclear power, the principal alternative to fossil fuel electricity. It is not too late. My advice to young people is to cast off the old politics and fight for their future on technological, political, and legal fronts. Really? I for one would care. How many people are eligible to vote? How many of them were polled? How were the polled group chosen as ‘representative’? If you don’t care about this sort of issue then you may as well have just repeated the first thing you hear in your internet echo chamber… oh wait it’s Victor…. Could you develop on that? Why are flat temperatures, in such a small time scale, the null hypothesis? And why do you say it would have been the most skillful? It is clear global temperature has been rising since the beginning of the 20th century. And in the period of reference, 1964-1983, global temperature has risen by about 0.1 degC. So why not considering a “persistence of the trend” rather than a “persistence of the mean”? Also, why is 1964-1983 the period of reference? Why not longer? Good question. I suspect that the writer wanted to paint Hansen’s testimony in the best light possible. By cherry-picking that temperature range, they were able to do so. Temperatures had been rising steadily since about 1910, but had stagnated after a steeper rise around 1940. I agree with your persistence of the trend rather than the mean. The null hypothesis is in essence a negation of the hypothesis. In this case, the hypothesis is that greenhouse gasses (or any other forcing for that matter–the attribution to greenhouse gasses depends on HOW the warming occurs) have provided a forcing sufficient to knock the temperature of the planet out of the range it inhabited heretofore. So, the null hypothesis would have to be that the temperature regime in the present is statistically indistinguishable from that of the past. Warming doesn’t just happen–at least not on a timescale as long as the current trend. It requires a large and continual source of energy. The only real candidate is greenhouse gasses.